When the door to our small mobile home swung open the afternoon of September 11, I was already there. My boss had immediately said, "Go" when I told him I wanted to be home when my 11-year-old son arrived from school. I had driven home under a pristine blue sky that looked surreal compared to the images in my mind of the terrorist attacks on the World Trade Center and the Pentagon. Suddenly the door swung open and my son was there, curious why I was home before he was. He knew that America had been attacked; teachers had announced it to the older elementary students before a directive came not to discuss it. However, my son was initially feeling more of a bravado about it - the enormity of the devastation hadn't really sunk into his eleven-year-old mind. He had only heard that planes had smashed into buildings and that America would certainly fight back. Carman didn't know that both of the Twin Towers had imploded and collapsed, and until we sat there together watching the coverage on TV, I don't think he had realized the enormous loss of life and devastation the terrorists had caused. So we sat there together, my son and I, on a beautiful early fall afternoon, watching the replays on TV of a plane seemingly swallowed into a tall building, watching fire and smoke mushrooming, people screaming, running, crying, and the towers of New York falling into the ground like a deck of cards. It was a much more somber child who sat and saw exactly what had happened to the United States of America played out on his television screen. We watched, we talked, and we prayed for all the victims and their families, and for the country we loved. After several hours of absorbing the news and listening to our President reassure the American people about what he termed was "an act of war" against our country, I decided that we needed a break from the shock of what had happened to our land. "Let's go visit Aunt Jane for awhile," I said, and I went into my bedroom to change out of the work clothes I'd had on since early morning. I pulled on a pair of jeans and a sweatshirt, walked out of my room, and then I saw him. My young son, all 5'5" of him, stood straight and tall in the middle of our living room dressed in his Boy Scout uniform. Tears immediately sprang to my eyes. "Do you think I should wear this?" he asked me. I looked at my son and I remembered stories of other Scouts from years ago - Scouts who had bravely ignored the blaring sirens during the Blitz of London in World War II and raced out to help rescue people buried in the bombed ruins of buildings, Scouts who harvested food, and evacuated children to safer places. I thought of the Scouts who had risked their lives to deliver messages to those working in the Resistance, and I remembered the Scouts who lived in Nazi occupied countries where Scouting was considered a serious threat and banned. Even under the threat of losing their lives, those Scouts of years ago refused to disband. Boy Scouts furtively exchanged salutes on the street and met secretly in the dark woods under starlit skies, refusing to give in to those who would extinguish their organization. In those dark, war-torn years of horror, boy and girls maintained their faith in their countries and Scouting, and drew from its ideals and traditions the strength of mind and of purpose to endure. My thoughts came back to the present; to my young son standing there in uniform, asking me if I thought he should wear his uniform that night - the night the fabric of America's safety and freedom was rent and torn. "Yes," I replied. "Yes, I think you should wear it. The Boy Scouts have always helped their country doing whatever they could and whatever was needed. During wartime the Scouts have always been part of our homeland defense, and I think it will make people feel a little bit safer and prouder seeing you in uniform." Carman nodded and then paused before he spoke. "I think I'll wear it to school tomorrow too," he said, and there was a strength in his voice I'd never heard before. My son, like most other young people, was suddenly changed on September 11, 2001. Now at bedtime there would always be a prayer for his country and all its allies, besides the prayers for loved ones he remembered each night. Now Carman saw himself not just as a boy, but also as an American citizen. 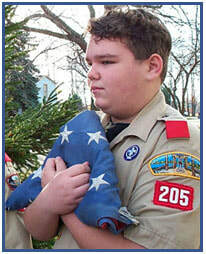 The words of the Boy Scout pledge he recites each week are not just casual words anymore, but a solemn vow. Out of the ashes and devastation, we saw America pull together in unity as never before in this generation. I saw it in the flags waving on street corners, and especially I saw it in the eyes of a young man who stood erect and tall in his uniform, while his voice rang out loud and clear: "On my honor, I will do my best to do my duty to God and my country..."
Anne Goodrich is a graphic designer in Kalamazoo, Michigan.This story was proudly written in honor of four important men in her life; her two dads - the late Army Lieutenant William E. Goodrich and Colonel Walter B. Forbes, USAF (Ret), her twin brother, Eagle Scout and former Scoutmaster Bill Goodrich of Troop 205, Kalamazoo, Michigan, and her son Carman Goodrich, Boy Scout and American citizen.